With only a couple of hours left from 2017 - enough time, though to make a little trip to one of my favorite places in Germany, Potsdam, for instance - it is about time to wrap up the travel year and look forward to the new challenges on the road. From many points of view, the last 12 months were a time of settling down while exploring new opportunities and creative work ideas. It was I time during which I tried to invest the best of my time and energies in increasing my audience and interacting with other travel bloggers and lovers and travel industry representatives. The result were not spectacular - I was not looking for some extraordinary 'boom' anyway - but at least stable enough to promise more substantial growth in the following months. My Pinterest advanced beyond 1,000 while my Twitter, which I greatly neglected most of the time, with a very limited participation to favorite weekly chats - like #TRLT - due to a lack of time and schedule conflicts is slowly about to reach 5,000 followers. My Facebook page is also going well, with diverse visual content posted regularly. As for Instagram, things are up and down, as for everyone else, but at least I am happy to use it for sharing my love for beautiful and colourful places around the world, and especially from Berlin. After all, what matters is the content and consistency of our messages. My biggest failure so far - in terms of target - is YouTube. With almost 100 subscribers, my channel is stuck in time for almost two years because me, the bold one, is not courageous enough to edit those videos and create the visual content that could offer more visibility to my written blog posts...Am I angry with my? Apparently, not angry enough to push myself to finally edit that February 2017 video from the Botanical Gardens in Berlin. This is one of my biggest social media aims for 2018: going beyond the YouTube's block and finally join the Army of video content creators from around the blogosphere. Probably there are much more things to keep in mind for my social media business card, and redesigning the blog is one of them, but as for now I am just trying to take everything easy, with the aim of a serious makeover at the end of the next year, latest the beginning of 2019. However, I felt that this year that my photographic skills improved, and I am more and more safe behind my camera. Although most of my professional time I used to be stucked with words, my blogging adventures forced me at a certain moment in my life to get out of my cave and take pictures. And very often, it makes me feel good to be able to share my visual journey as well. Being a (travel) writer means also that you have to search always for good writing inspiration for honing your juggling with words skills. Due to one of my others professional assignments - which is being a book reviewer - I have the chance to be offered lots of interesting books connected to travel and it was my pleasure lately to share some of my best selection to inspire a meaningful journey in 2018. As often as I can, I will keep sharing my love for books as well, besides my favorite destinations in Berlin, Germany and elsewhere. This year, I've spent most of my time in Berlin, either exploring new neighbourhoods or discovering hidden jewels, especially of architecture, or just eating burgers, lots of them. Or some ice coffee, with a glamorous view on my favorite avenue in Berlin. In the next months, I will keep sharing more and more interesting neighbourhoods, like Grünewald, many of them off the usual touristic beaten path, but a great idea to explore if you have more time to spend in the city or you are, like me, a curious expat always keen to discover new destinations for an interesting time, without leaving the city. After 10 years of knowing the city, Berlin remains an exciting place to live and sharing my love of life here is still a flame. In 2017, I was happy to reveal the best destinations for movie lovers and there is at least one article about specific places for people looking for some very special places to see and visit. Stay tunned! With many summer weekends spent in the city - the best time of the year to be in Berlin, by the way - I had the chance to be part of many open house events, during which I was able to see the art collection at the German Federal Bank, have a look around the German president's office or explore the Museum of the Future, scheduled to open up in 2019. Can't wait to share more love from Berlin soon! Most of my travel this year brought me into places I always wanted to visit in Germany, like the famous spa of Baden-Baden, that most probably would love to see again. Another highlight of my last 12 months was Stuttgart, with its famous library but also other interesting stories I was happy to share in a post about how to spend 48 hours in this relatively underrated city. 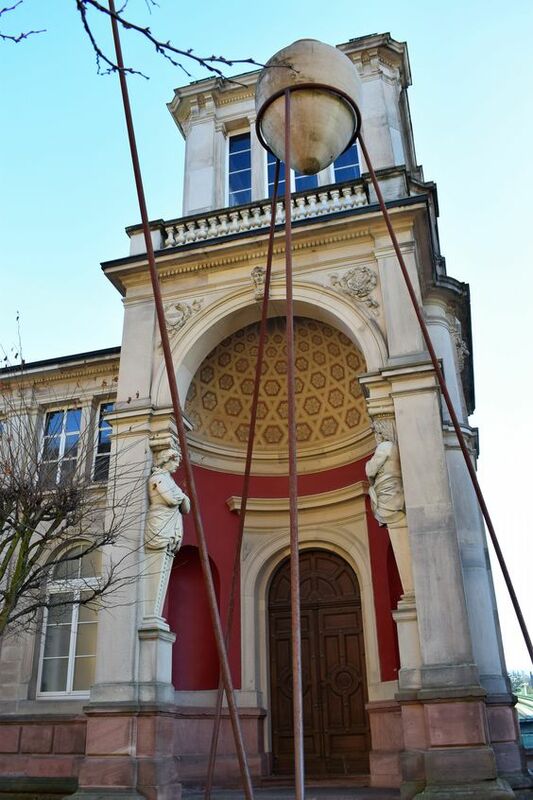 I've spent the same amount of time in Karlsruhe for my birthday week celebrations, and I was offered a lot of pleasant surprises. The Northern port city of Hamburg was again high on my list, and I was happy to be back again, to visit this time the famous Elbphilharmonie finally inaugurated. My plan is to be back there, most probably in the first half of January, for even more interesting revelations. Like Berlin, Hamburg is one of those cities that the more you visit, the more you discover how little you know about. I was lucky enough to be back to Görlitz in a day when there were an open house for historical buildings and therefore had the chance to have a look inside the Art Nouveau Department Store where scenes from Grand Budapest Hotel were filmed. What will the next year bring? Although I do not fancy big plans when it comes to travel, especially when you travel with a little baby, I know that I want my German travels a bit more organised, with plans to cover some local festivals and traditions, as well as specific regions. I would love to see more from the Northern part of Germany too, and do some more hiking around, including in the Black Forest. In any case, keep an eye on my blog for more revelations and if you have a special destination in mind you would love to be featured, let me know! Like most of the travel bloggers, I do aim at seeing all the countries in the world, at least once, but for various reasons, slowing down is what I have to deal with for the time being. Which doesn't mean that short-term trips are not possible. The luck of living in Europe is that the next country can be just one step away. It is the priviledge of living in an open space of freedom and hopefully more tolerance and mutual understanding. 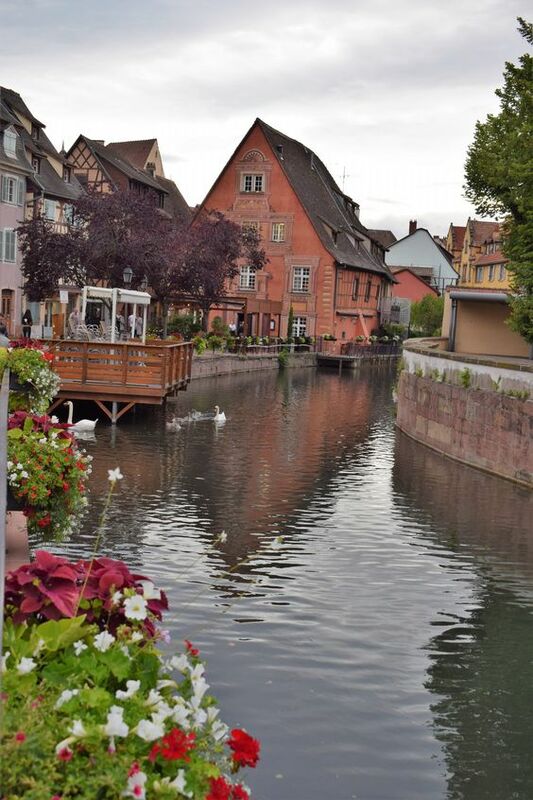 From the picturesque city of Freiburg we took a bus until the colourful city of Colmar, a must see destination in the Alsace region, especially during the winter holidays season. With Mulhouse only a couple of minutes away, we took one more chance to visit another French town and get even hungrier surrounded by so many appealing Alsacian food choices. Another short trip outside Germany this year was in Poznan, a city I've been recommended for both the architecture and the youthful vibe. It was a really good choice and I was more than happy to see so much history and colourful houses, and taste some local pelmeni too. What 2018 has in store for me? There are no clear plans as for now, but be sure that wherever I go I am trying to bring you the best of any destination, regardless how far away is from your everyday home. In most cases, I am a very fast forward traveller, as I mostly arrive in a place I am not sure will have the chance to visit again, with a packed agenda of places to see and visit. My camera is running wild and at the end of most trips, my feet are feeling the burden of tens of thousand of steps carefully recorded lately by my sophisticated smart phone health apps. This year, however, was a bit different in this respect. Although I very often travel solo, in 2017 I've slowed down a bit and was joined by friends sharing my love for travel and curiosity for discovering more places in Germany. And what a great experience it was. The pleasure of having a travel partner to share histories and connect places and create a special ambiance to remember the trip may overcome the fever of snapping pics after pics and writing crazily in your notebook observations about a place. Although both are needed for a good travel article, you can realize that, after all, your impression about a place is what lasts, as the long bucket lists are very often features everywhere by every one. Your own impressions is what makes your travel report interesting and relevant compared to other people's writings and those memories are best preserved when you share and create them together with friends. Cheers to more travel with friends in 2018, then! What is love if it is not shared? Especially love for travel and beautiful destinations in Germany and abroad? In the last half of 2017, I had the chance to collaborate to various articles recommending my places to see, especially in my beautiful host country. My collaborations started in the right season for making travel recommendations. We usually travel during the summer, but we just start to understand the beauty of going outdoors in the autumn too. The lovely Maria, from the Global Brunch, included my recommendation in a highly travel inducing post about best places to see fall foliage around the world. Check out to read my recommendation too! It is about a place in a neighbouring country famous for more than one single reason. 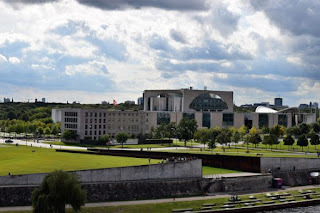 Encouraging myself to be more bold with my photography skills, I shared a photo featuring the German governmental offices - Berlin's institutional architecture was a highlight on my blog this year - on the Sunday Photo on Travel Joy Enjoy Repeat. I was back on this blog at the beginning of December with a short mention of my favorite Belgian beer: Kriek St. Louis, in an article about the local famous beverages. Will you travel for beers? Why not? I was happy to share another travel autumn recommendation for Roam on Our Own. Besides my choice, which is a very special German castle, you can check many other gorgeous recommendations - and more castles too! Sometimes, I do recommend books too, and I was glad to be part of this collaboration initiated by Jim from Travel Stories and Images, where I share one of my favorite travel books of the year. Check out the link to find out some more inspiration for your travels and writing too! Last but not least, I had an interview with Ana, a Serbian blogger, about my favorite places in Serbia, a country I visited many years ago during my frequent, at the time, Balkan travels. What I wish to myself is that at the end of 2018, to have at least the same feeling of fulfillment and clarity of my personal and professional goals as I do have now. Hopefully, I can do it better, much better! Happy 2018 travels, dear readers, from the always surprising big city of Berlin!